Sarah is involved with and supports her local Food Bank in Eastbourne. She has began volunteering after she became a mum to her daughter Camille. With a new baby, I suddenly found constraints on my time and mobility that I was not used to and yet, now more than ever, I felt I needed to reconnect with my community, meet with other grown ups and feel like I could still contribute in a meaningful way while I wasn’t working. I had recently read an article about the local Foodbank and was surprised to learn that they did not only collect and distribute food, but also clothes, toiletries, bedding and many other things besides. 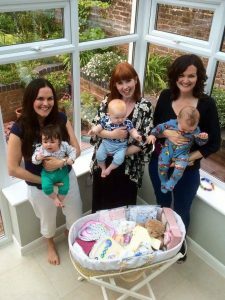 I had been struck by the enormous amount of ‘stuff’ that you need to prepare for the arrival of a baby but we had been so fortunate both to have disposable income and very supportive family and friends and had not struggled for anything. Still it was hard, and still I had found it challenging at every turn. I couldn’t imagine how much more difficult it would be if you couldn’t afford basic things like nappies, baby clothes, bottles or a Moses basket. I decided to donate a few things that we had spares of and while I was there, I had a chat with the people at the food bank about their aspiration to offer Moses baskets filled with essential items to new mums returning home from hospital with nothing. I thought this was a wonderful idea and something that I could encourage through my new network of mummy friends. So, after chatting with a few people, a couple of friends and I sat down together with our babies and worked out how best we could help. We produced publicity material to raise awareness of what was needed, we started promoting our cause through social media networks, we set up appeals for specific items and we organised the bake sales, raffles, clothes swaps and raised nearly £400 in two months. More importantly, donations of baby items to the food bank rose dramatically to the point where they had to stop asking people to donate to the project! 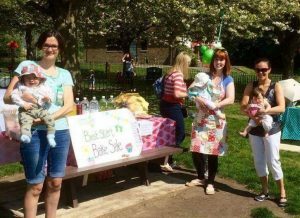 Sarah, Roisin and Anna (with their little ones) at one of the Bake Sales they organised. It felt wonderful to be volunteering alongside such a fantastic organisation and to have helped make a difference to so many lives. I was able to meet some inspiring friends and we continue to try to find new baby-friendly ways to make a difference locally. I’m really proud of what we achieved together. Can’t find what you were looking for? If you have a question about becoming a volunteer click here to see who can help.